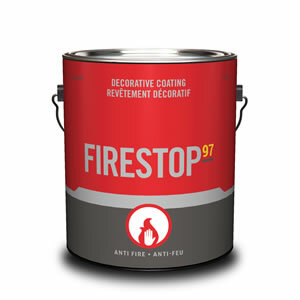 FireStop97 delivers one-coat, “Class A” flame spread protection in a beautiful solid color wood finish. A beautiful interior decorative coating available in white or pastel colors, FireStop97 is designed for use as a self-priming paint for wood substrates including SPF plywood, oriented strand board, wood trusses, glue laminated/cross laminated timbers, construction studs and many assemblies where improved fire resistance is required. In the presence of heat or flame, Firestop97 will intumesce (expand its film thickness) creating a thick charred heat-insulating foam layer. This action prevents oxygen from reaching the combustible coated materials (the “fuel”) and diluting combustible gases if released by the fuel. View the Sansin Firestop97 Product Data Sheet (PDF) for information about application, preparation, maintenance, and more.